X-O Manowar fans probably know as much about the Vine as Aric of Dacia. What they might not know about though is their leader Commander Trill. 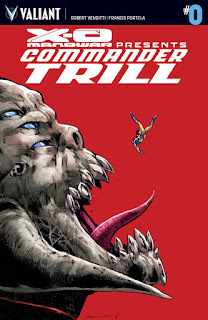 That changes in December, thanks to X-O Manowar: Commander Trill #0. 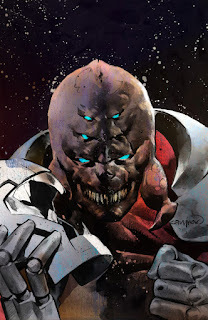 The next essential zero issue is written by Robert Venditti and illustrated by Francis Portela, offering readers a return to the roots of the Vine's brutal alien empire. X-O Manowar: Commander Trill #0 features covers by Phil Jimenez, Cary Nord and David Lafuente. From Aric of Dacia’s escape with the X-O Manowar armor to the destruction of his own home world, pain and consequence have haunted the life of the alien general called Commander Trill. Now, on the eve of the most devastating assault yet, find out why with an essential, standalone zero issue detailing the battle-scarred life and origin of the Vine’s mightiest military leader...and an all-new prelude to X-O Manowar’s most terrifying clash of the year! Coming in December from Robert Venditti & Francis Portela! This winter, Valiant presents its next essential zero issue…revealing the never-before-told origin of X-O MANOWAR’s unrelenting arch-enemy! Valiant is proud to announce X-O MANOWAR: COMMANDER TRILL #0 – a special jumping-on point for Valiant’s flagship series from New York Times best-selling writer Robert Venditti (WRATH OF THE ETERNAL WARRIOR) and rising star Francis Portela (Green Lantern)! This December, return to the roots of the Vine's brutal alien empire to discover the beginnings of X-O Manowar’s dark nemesis and one of the Valiant Universe's most formidable villains – the cold and calculating Commander Trill! 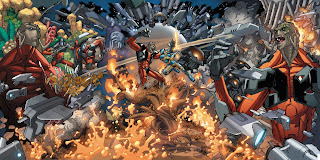 Featuring covers by blockbuster artists Phil Jimenez (Infinite Crisis), Cary Nord (X-O MANOWAR), and David Lafuente (Ultimate Spider-Man), be here this December as Robert Venditti and Francis Portela chronicle the beginning of Commander Trill’s shattered destiny with an all-new one-shot introduction to the many worlds – and many foes – of Valiant’s most powerful hero, only in X-O MANOWAR: COMMANDER TRILL #0!